There is a lot of fascination with Google and for good reason. Google is a very innovative company that has generated a ton of revenue in a relatively short time. A while back we at Enquiro described how Google makes money. In 2005 Google’s revenues were over $6 billion on which they had a gross profit of 3.56 billion and earned about $1.5 billion in net income. 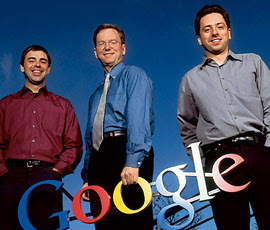 In 2006, Google experienced revenues of 10.6 billion with a gross profit of 6.38 billion and a net income of 3.07 billion. Not bad for a company that is less than 10 years old. (Google officially launched in September of 1998.) So how does Google make money? Well in essence, it all strated in 2000, when Google introduced AdWords, a self-service ad program that could be activated online with a credit card in a matter of minutes. With an update to Google AdWords in 2002, this ad based revenue was now based on cost-per-click pricing, where you only pay when people click on your ad. Google generates billions of dollars based on this ad revenue. In addition, Google also has a program called “AdSense” which allows individual webmasters and site owners to place Google ads on their sites and earn a percentage on every click. It's fair to say that Google earns millions per day from Google earns millions per day from their ad network. Keep in mind that Google's value is not just due to the ad sales. Google's share price is also strong and has been since it went public in 2004. As of this past week, Google's share price was around $525, a far cry from the initial share price of $85 when launched a few years ago. Oh yeah and Google does have an online store by the way. They sell everything from Google-wear to hardware and software products such as the Google Mini and other Enterprise solutions. While I'm not sure how much revenue is exactly generated from these products, it must be substantial as Google has the ability to provide a number of free products and services to the general public. Google has a brand value of $66.4 billion making it the top brand in the world. Google is the leader in the search engine marketing industry as further evidenced is presented from ComScore Networks Inc. which said Google Inc.'s (GOOG) sites captured 50.7% of May's U.S. search-engine market, with 3.9 billion search queries performed. As you can see most of Google's revenue is derived from its online advertising programs, but that is not the only source of their revenue stream. It is however their bread and butter and will continue to be moving forward. Or will it? Google has released Google phones in Europe and what about the rumors of a Google computer, or monetized version of a Google "office suite". Google continues to innovate and acquire a number of companies an technologies. As a result, Google will continue to make money for a lot of years to come.